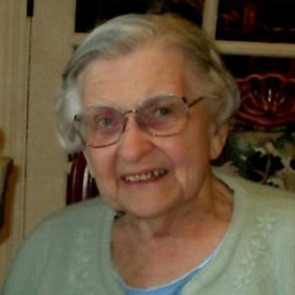 Rosa E. (Abbott) Krissek, 96, formerly of Leawood, Shawnee, and Kansas City, KS, died Saturday, March 30, 2019, in Dublin, OH. She was born December 30, 1922, in Cincinnati, OH, the only child of Thomas and Minnie Abbott, who brought her to Kansas City in 1924. She graduated from St. Mary College, Leavenworth, with a degree in chemistry. In 1946 she married Walter Krissek, who preceded her in death in 2001. She was an active volunteer at Cathedral of St. Peter’s grade school and Altar Society, a Cub Scout Den Mother, and a volunteer for 14 years at West Wyandotte County Library. In 2004, she moved to Dublin, OH. She sought to live a life characterized by independence and self‑sufficiency. She found great comfort and support in her faith, her husband, and her family, and she enjoyed the activities of being a homemaker. Mrs. Krissek is survived by her three sons, Thomas J. Krissek (Donna), Grayslake, IL, Lawrence A. Krissek (Debra), Ostrander, OH, and Gregory P. Krissek (Beth), Manhattan, KS; a sister-in-law, Dorothy Koska, Washington, D.C.; five grandchildren, one great-grandchild, and one niece. Visitation will be from 9:30 to 10:30 am Monday, April 8, at the Cathedral of St. Peter in Kansas City, KS, followed by funeral liturgy. Burial will be in Resurrection Cemetery in Lenexa. Please omit flowers. Consider memorial contributions to St. Mary University, 4100 South 4th Street, Leavenworth, KS 66048 or to Jesuits Central and Southern Province, 4511 West Pine Blvd; Saint Louis, MO 63108. Greg, Beth and Family, Take comfort in knowing you were richly blessed by a loving mother. Our prayer is that during this time, the Lord will bless and keep you and yours. Greg & Beth, We are so very sorry for your loss. Your mother must have been a very special lady as her son is a kind and special man. We will keep you and your family in our prayers. So sorry to hear of Rosa's passing. I remember her fondly and her home just 2 blocks up the street from mine on 15 th street!. Thoughts and Prayers to you and your family. May you cherish the memories and good times. God Bless. Sorry to hear that Rosa passed away. She was a great lady who was intelligent, great wife and a person I am proud to have known. She will be missed by all. Dear Tom, Donna, Jeff, Danny & family. Please accept our sincere condolences on the loss of your mother/grandmother. Please know that all of you are in our thoughts and prayers. Sorry to hear of your loss Greg, your family will be in our prayers.